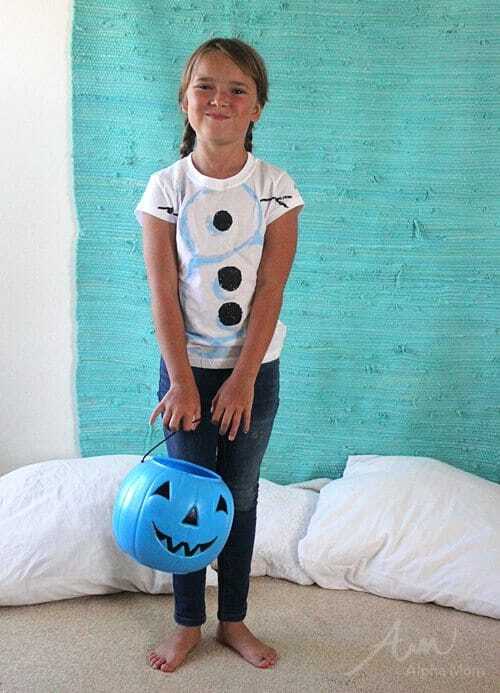 Skip the lines for Frozen-themed Halloween costumes this year! We’ve got something much more casual that will be a hit for your jeans-wearing kids. 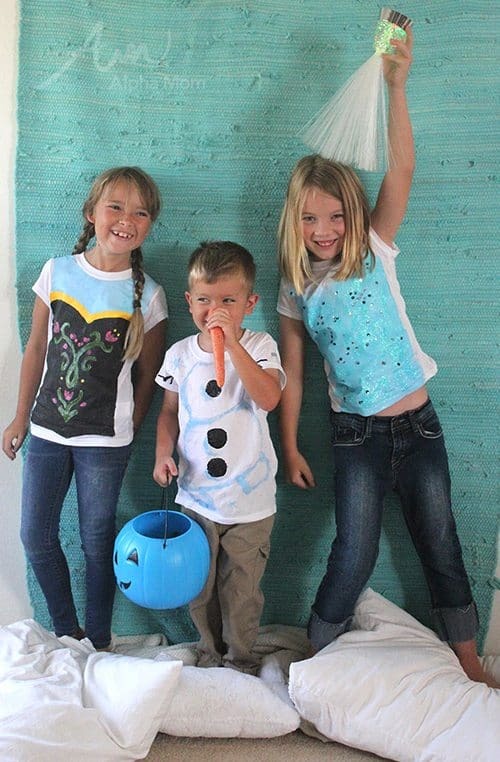 Make your own Anna, Elsa and Olaf costumes for Halloween and every day. The kids might even want to wear these costumes to school. 1. pre-washed white t-shirts. I bought these t-shirts online because my daughter likes a slimmer fit but you can easily pick them up at your local craft store or big box department store. I’d also like to note that fabric paint is extremely permanent (in a good way!). So be prepared and put paper down to protect your space and where you are working. Don’t wear your favorite clothes when you are painting and wash stains immediately before they dry. Once they are dry they are pretty much there forever. Don’t be intimidated though. Fabric paint is fun! First slip a piece of cardboard inside your t-shirt. You’re going to be applying a lot of fabric paint and it’s probably going to soak through so you’re definitely going to need something inside your shirt to keep it from bleeding onto the other side. Even a layer of wax paper or tin foil over the cardboard won’t hurt. I started out with my print out inside the t-shirt, thinking I could trace my design and make painting easier. This was a mistake because the paint stuck to my computer print out and it was a pain to peel off later. You can use the print out for tracing purposes too but maybe just use a washable marker that you can paint over later and don’t leave the print out inside the t-shirt like I did. Here is the guide for your Anna costume/ t-shirt. Just click and print. You can free-hand it like I did using the above as a visual reference. You can trace it with charcoal or washable marker (removing the guide before painting) OR you can cheat and just print the guide out on iron-on paper and skip the whole painting mess altogether! But of course that will only work if your child wears an 8.5 x 11 t-shirt or if you are handy with a color copier. First lay down the dark color of Anna’s bodice. This is a lot of paint so plan to let it dry for a good long while before you lay down your other colors on top. Fabric paint often comes in squeeze bottles but for the bodice of this costume, you’ll want it flat and not puffy so squirt yourself a good blob of paint on a paper plate and then apply it onto the shirt with a paintbrush. Once the dark black/gray is set then add your swipe of yellow at the top and blue above that. Then after the bodice is dry you can paint in the flower decorations. You could go ahead and squeeze your vines and flowers on with curly-ques and loops. Fabric paint loves to be three-dimensional. It wants to stick up off the shirt in streaks and blobs so you can either work that way or do it like I did and paint your vines a little flatter. Both ways work. The puffy paint look might just take a little longer to dry. A good trick for making the dots is to use the other side of your paint brush. It will create a perfect circle instead of an oblong dash that the brush side will want to make. Just make sure you clean off both ends of your paintbrush when you’re done! 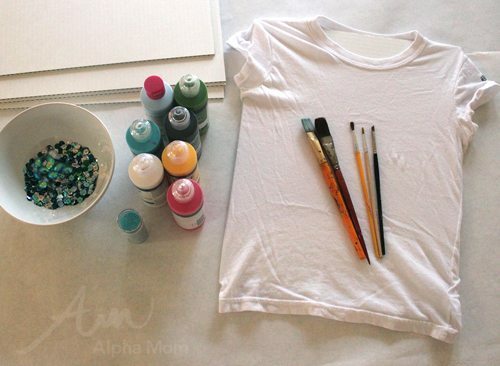 When you’re done painting just let your t-shirt dry (follow the instructions on your fabric paint) and you’ll be good to go! Here is the guide for your Elsa costume/ t-shirt. Just click and print. 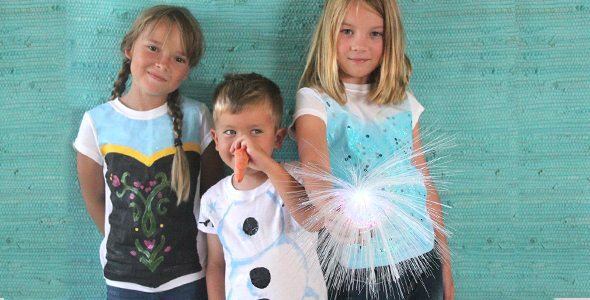 The Elsa costume/t-shirt is so easy to create that it practically paints itself. All you’ll need are two shades of light blue (aqua works too). First paint the bodice. Create a v-shape at the top. Then paint a lighter blue on top of the that v-shape. Add glitter and sequins before your paint dries (don’t worry, you’ll have plenty of time) and that’s it! Easy peasy! If you’re feeling extra creative, give Olaf a try! I don’t have a guide for that but if you’ve gotten this far, I’m pretty confident you can do the rest. Just paint two big rolly polly snowballs for the body, some little marshmallow shaped feet, black buttons and some puffy paint lines for stick arms! Let it all dry while you watch Frozen on repeat and you are ready for a magical Frozen Halloween, casual-style! Appropriate Age levels: Teens to adults for detailed painting but littles can always join in with adding glitter and sequins! Time allotted: half hour to 1 hour per shirt. Allow one day for drying time. This is genius! Love that it can be worn after Halloween too. And Bug makes a super cute Anna with her braids. This is perfect! I’m doing a Frozen themed birthday party for my daughter in December. She’ll be dressed up as Queen Elsa and I wanted to dress up as Anna, but adult costumes are so expensive. I can do the shirt with a blue skirt and pull off the same look. Can’t wait to try that. Absolutely LOVE this solution to Frozen costumes. We would love to mention it on our blog! What brand of fabric paint do you use? Thank you for the tutorial, the shirt came out great! Can you tell me which colors you chose? I’m new to fabric paint/wearable art (new to crafting in general, really) and am really overwhelmed by all of the choices in the store! black, yellow, apple green, two shades of icy blue (light and dark), some glittery white and pink! Sorry I didn’t get this question earlier. Hope that helps! What website do you buy the fitted t-shirt from? Can you advise the brand of tshirt you used or where you purchased then from? I am having no luck finding fitted shirts for girls. I think a small size bottle should be enough (4 oz?) but I always error on buying too much personally because I hate going back to get more and I can always use it… You can take a bottle back if you don’t open it. Hope that helps! 80% cotton / 20% polyester fleece.